The duo plan to develop a product that is able to remotely monitor hypertensive patients and get them care faster. Yesterday Babyscripts, a virtual obstetrics care management platform, announced that it is teaming up with Penn Medicine on a new initiative designed to improve postpartum health. The pair plan on combining Babyscripts’ remote monitoring system with the knowledge gleaned from Penn Medicine’s Heart Safe Motherhood (HSM) program, a text-based intervention for pregnancy-related hypertension. The end goal is to develop a product that is able to remotely monitor hypertensive patients, thus pinpointing the patients that need more attention and being able to intervene more quickly. The partners said this could help clinicians catch signs of rising blood pressure earlier, decreasing the lengths of hospital stays and readmission rates. Hypertension occurs in 6 to 8 percent of pregnancies among women between the ages of 20 to 44 in the US, according to the CDC. If it goes untreated, the condition is linked to complications including preeclampsia, eclampsia and stroke, according to the agency. During the postpartum period high blood pressure can be an indicator of postpartum preeclampsia, a rare but serious condition, according to the Mayo Clinic. In the statement announcing the partnership, the duo cited a clinical trial comparing traditional office-based follow up to HSM’s remote texting based blood pressure monitoring program immediately after discharge. Researchers found 44 percent of women in the traditional settings had their blood pressure data captured 10 days after discharge compared to 92 percent of women using the platform. Babyscripts has had a busy year. At the beginning of January, Babyscripts announced a $6 million raise led by Royal Philips, with participation from StartUp Health and NueCura Partners. This came about six months after the Washington D.C-based startup announced that it had acquired the provider-delivered pregnancy app iBirth in an effort to flesh out its enterprise offering and further drive patient engagement. Penn Medicine has been involved with digital health for some time now. Besides the HSM program, it has also created a center for connected care to streamline telemedicine services. It was also one of the first health centers to participate in Apple Health Records. “This is another example of what Babyscripts uniquely brings to the table. For us, it’s not just technology tools. It’s protocols and best practices that have proven success. 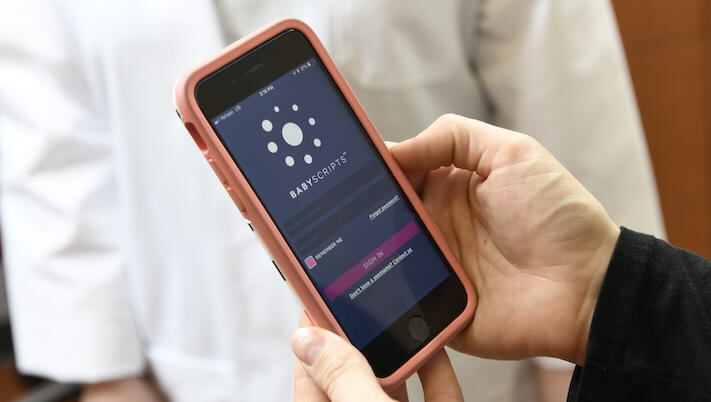 Our goal is completely redefining maternal care, this is another huge step towards eliminating complications,” Juan Pablo Segura, president and cofounder of Babyscripts, said in a statement.